Welcome to Pebbles at my Feet Natural Stone Adornments where you'll find artisan gemstone jewelry featuring tumbled stones, backyard pebbles, and gemstone beads with meticulously crafted sterling silver, copper, brass, bronze or gold-filled settings. Here, the focus is on stones and artful wearable jewelry for the nature-loving, active, free-spirited woman. Natural stone jewelry is always one-of-a-kind. Even when a design is repeated, variations in a particular stone's color, polish, and translucence along with made-by-hand wire settings add unique character. Whether you choose simple pebble drop earrings, charm style bracelets bursting with stones, lavish cluster earrings, or gem-studded wire work necklaces, you can be sure your jewelry is as special as you are. Shop distinctive artisan jewelry for you or to give from Pebbles at my Feet. Made in South Park, Colorado, by artisan Pamela Hollis. 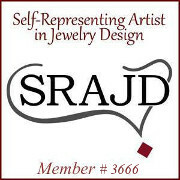 Self-Representing Artist in Jewelry Design SRAJD member 3666.